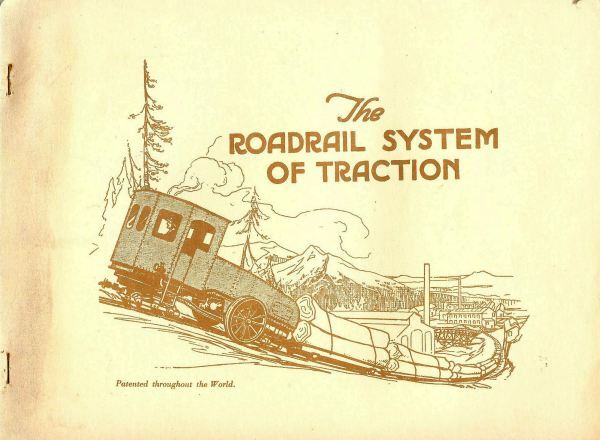 The Roadrail system was an attempt to combine the advantages of road and rail transport, for use in remote areas where only narrow-gauge rails combined with sharp corners and steep inclines were economically viable. 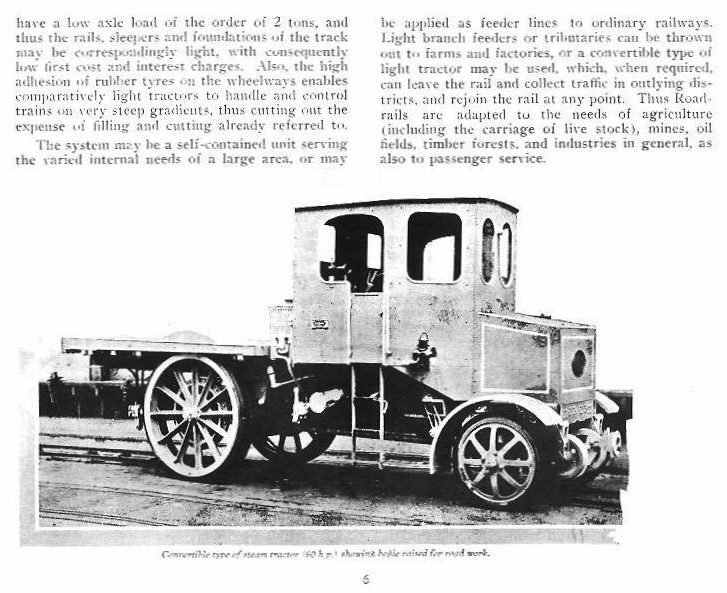 The idea is that one or two bogies underneath the locomotive (or 'tractor' as it was usually called) ran on rails for directional guidance, but propulsion was by means of road wheels contacting prepared ground on either side; these road wheels carried most of the weight of the tractor, so the railway part could be very lightly constructed. 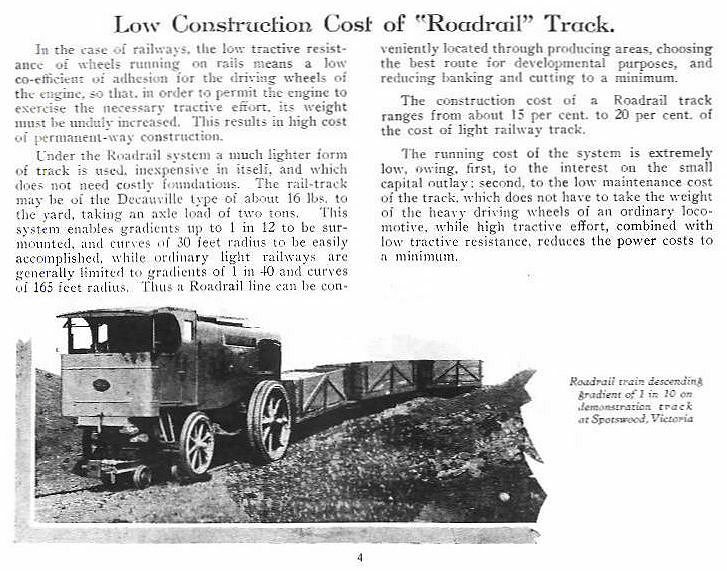 The rail wheels had very low rolling resistance on the rails, while the road wheels had much more grip when going up an incline. 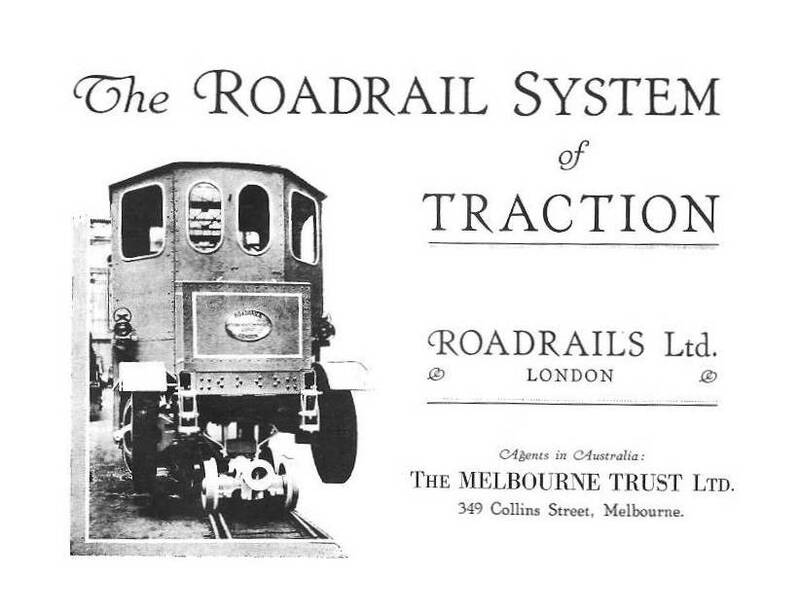 The system was promoted by Roadrails Ltd of London. This system seems to have had some success but is today almost unknown. 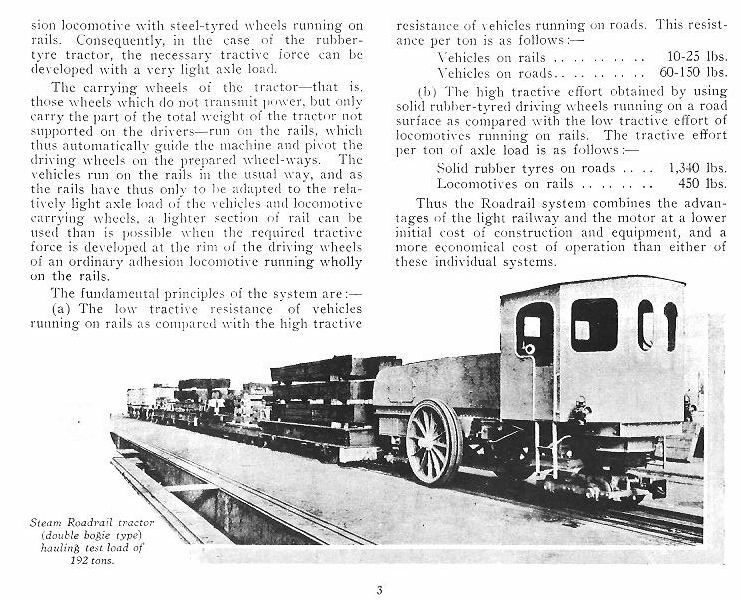 I am grateful to Andy Chapman of the Sentinel Drivers Club for alerting me to this strange business, and providing a copy of a booklet entitled 'The Roadrail System of Traction' from which the images here are derived. The illustration appears to be based on the double-bogie steam tractor illustrated below. The train appears here to be going up something like a 1 in 3 gradient, which was perhaps a bit optimistic. The usual maximum gradient quoted was 1 in 12, which is still much steeper than a conventional adhesion locomotive could climb. 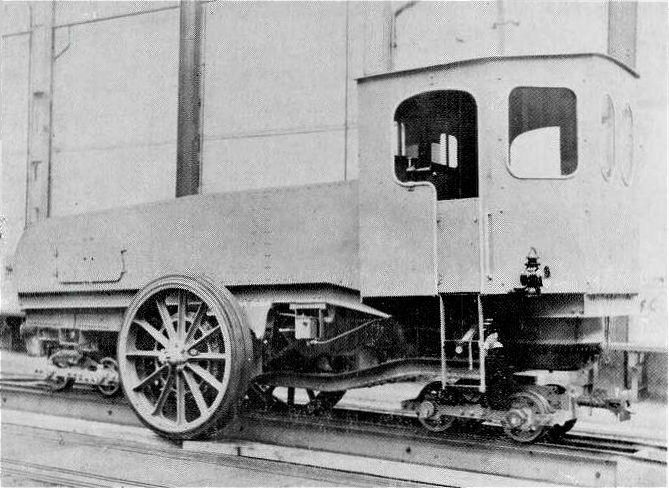 This version of tractor has rail bogies at front and back, with a pair of roadwheels in the middle. It was built by Beardmore, and had a Sentinel vertical boiler at the front of the cab. The location of the engine (presumably of Sentinel manufacture) is currently unknown. There is a remarkable website covering this sort of thing. 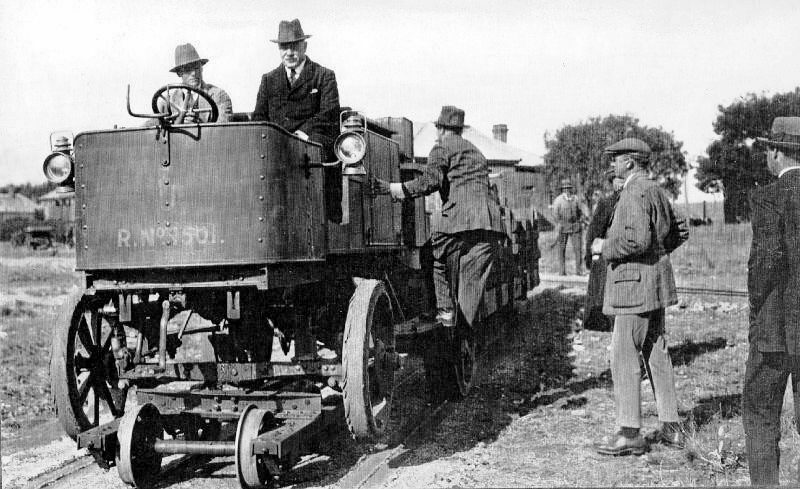 See Stronach-Dutton road-rail which has a 27-minute film of roadrail in operation, taken in 1925. It is clearly a seriously wobbly form of transport, because no great care appears to have been taken with the prepared ground on either side of the track, causing the tractor to roll back and forth like a ship in a rough sea. The waggons being pulled also roll badly, presumably because they are wide vehicles carried on narrow-gauge rails (2-foot in general) so any track irregularities are exaggerated. This is the Beardmore-Sentinel tractor shown above, before the Sentinel boiler was installed. The location of the engine has not so far been discovered; it was presumably under the frames, but Sentinel engines were usually vertical. At the end the point is made that the rails could be very light as the road wheels carried most of the weight of the tractor. I'm afraid some of the text is slightly blurred, for reasons unknown. This is also true of some other pages. 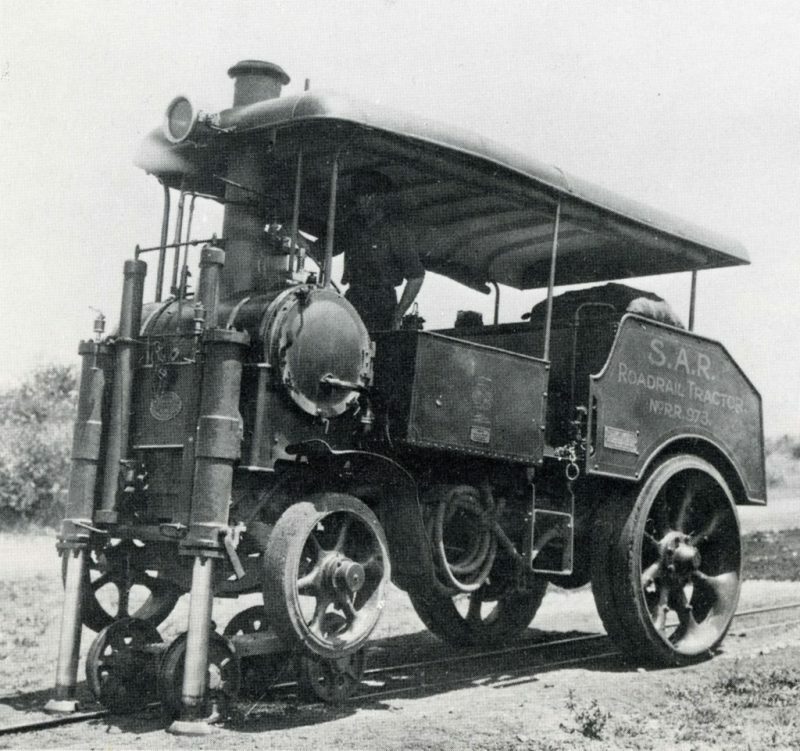 The caption reads: 'Convertible type of steam tractor (60 HP) showing bogie raised for road work'. It looks very much like the Beardmore-Sentinel tractor shown above, but it has gained a second set of wheels, and a sort of bonnet has been added to the front. 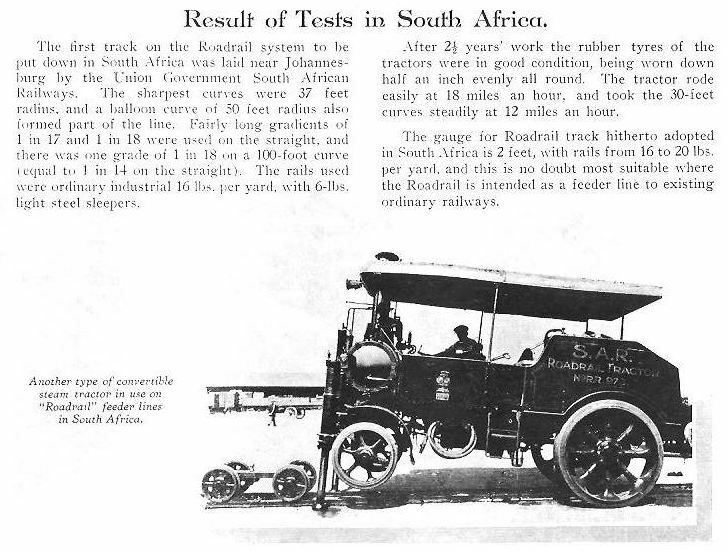 The Roadrail system was used in South Africa using 2-foot-gauge rails. At 16 pounds per yard they were much lighter than in normal main-line railway practice. This South African Railways tractor is most intriguing. It has a transverse boiler at the front; it seems the engine is under the chassis, as in an undertype traction engine. The front wheels appear to be flanged, but the view may be deceptive, as it seems unlikely they were intended to run on standard-gauge rails. The four-wheel narrow-gauge bogie at the left is attached by lifting up the front of the tractor with a pair of hydraulic rams. This machine, No 973, was a conversion of a Yorkshire Patent Steam Wagon. These wagons were notable for their transverse boiler with a central chimney, designed to avoid problems when tilting on uneven ground. This is No 973 again. In this remarkable picture the front wheels clearly have tyres on. This is a good view of the transverse boiler with its central chimney. 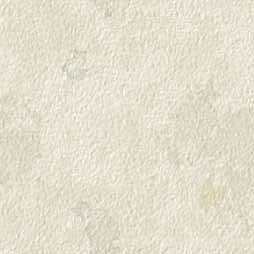 This is No 1501. It was a conversion of a paraffin-engined Dennis tractor. 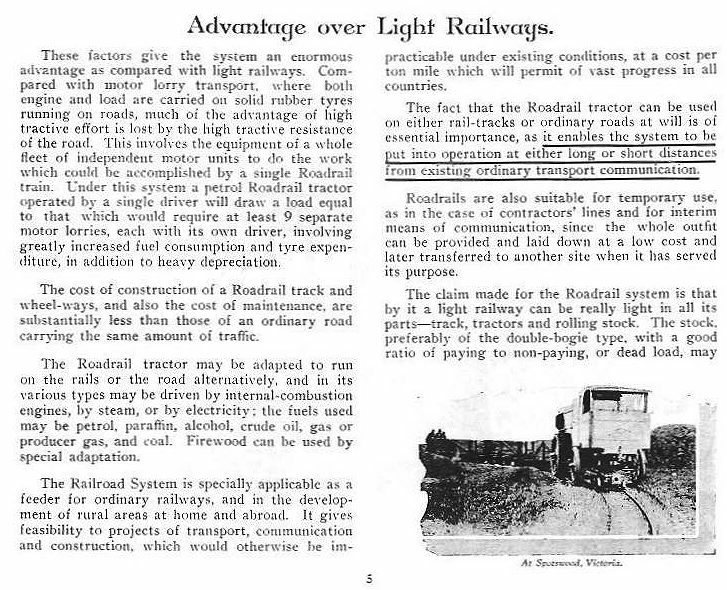 The Roadrail system was also used in construction work for the British Empire Exhibition at Wembley Park, London, and later for transporting visitors around the site. The system was apparently also used in Scotland, Spain, Morocco, Palestine, Uganda, Australia, Tasmania, and India. Investigations are proceeding.